*pH Stability under gradient conditions. pH stability is 1.5-10 under isocratic conditions. **2.1 mm ID Kinetex columns are pressure stable up to 1000 bar. Use the Kinetex 2.6 µm Calculator to preview the significant advantages orf increase effiency, resolution, reduced analysis time, and cost savings bu utlizing 2.6µm core-shell technology in place of fully porous particles for HPLC and/or UHPLC methods. For and added benefit, method conditions can be adjusted within the calculator to illustrate the inpact on your separation and lab. The Kinetex 5 µm Calculator demonstrates how replacing 5 µm fully porous columns with 5 µm core-shell HPLC technology can deliver better chromatography, higher productivity, and cost savings. Kinetex® 1.7µm,2.6µm and 5µm particle sizes are completely scaleable。This flexibility makes Kinetex optimized for different systsm platforms and are transferable from UHPLC systems to conventional HPLC systems to preparative applications. With Kinetex®core-shell technology, you can develop high performance LC Methods on any system and transfer them anywhere. Learn the best way to maximize performanxce of your Kinetex HPLC/UHPLC column withe the tips below. Alternatively, a PDF of the Kinetex Column Care guide is available in additonal languages. The arrows on the column tag indicate the flow direction. Phenomenex recommends the use of HPLC / UHPLC Sure-Lok™ High Pressure PEEK™ male nut fittings for installation of Kinetex columns on HPLC / UHPLC systems. The convenient one-piece design (AQ0-8503) is pressure rated to 12,000 psi (827 bar), while the 3-piece unit (AQ0-8504 with AQ0-8505), which contains a PEEK nut, a ferrule, and stainless steel gripping ring, will provide leak-free connections up to 19,000 psi (1310 bar). A handy fitting tightening tool (AQ0-8530) is available to facilitate achievement of a leak-free connection. Installing your Kinetex column on a Waters® AQUITY® UPLC® system? Click here » to see how easy it is! Kinetex C18, XB-C18, Phenyl-Hexyl and C8 are pH stable from 1.5 – 10 under isocratic conditions. Use only high purity reagents and high quality chromatography grade solvents to prepare mobile phase. Trace impurities can dramatically degrade column lifetime. Degas and filter all mobile phase prior to use. Ensure sample (and matrix) are completely soluble / miscible with mobile phase. Immiscible solvents or buffer salt precipitation can permanently damage the column. The maximum operating pressure for Kinetex 2.6 µm columns is 8,700 psi (650 bar)**, and for Kinetex 1.7 µm columns is 15,000 psi (1000 bar). The mobile phase flow rate should be set such that the column backpressure does not exceed this maximum operating pressure. Note that operating at or near the maximum pressure will result in shorter column lifetimes. Kinetex columns can be used up to a maximum temperature of 60 °C. Reduced mobile phase viscosity (and backpressure), increased mass transfer rates, and enhanced selectivity will be realized above 25 °C. When operating at high pH (> 8), lower operating temperatures are recommended for longer column lifetime. Note that operating at or near the maximum temperature will result in shorter column lifetimes. Column storage for a period longer than several days is recommended in ≥ 50 % (v/v) acetonitrile in water or methanol in water. If the mobile phase contained buffer salt, then flush the column with 10 to 20 column volumes of water / acetonitrile or water / methanol to remove the buffer salts before storage. After flushing the column, insert column end plugs securely to prevent evaporation and drying out of the column bed. Column storage for a period longer than several days is recommended in 90 % (v/v) acetonitrile in water. If the mobile phase contained buffer salt, then flush the column with 10 to 20 column volumes of 90:10 acetonitrile / water to remove the buffer salts before storage. After flushing the column, insert column end plugs securely to prevent evaporation and drying out of the column bed. Achieve better quality data and higher productivity with Kintex Verify! A web tool designed to help you get the most out of the advanced Kinetex core-shell technology. No Time. No Resources. No Problem. PhenoLogix Method Development Services is our in-house analytical support laboratory for all your method development and optimization needs. Our customized and confidential approach to supporting your methods will ensure a successful project and your complete satisfaction. Identify the correct column stationary phase, particle type, and dimensions to give optimum performance. A Phenologix representative will assist with method transfer and demonstrate that the method works in your laboratory. Kinetex Core-Shell Technology columns can be used on any HPLC or UHPLC system. Watch our videos to learn more. 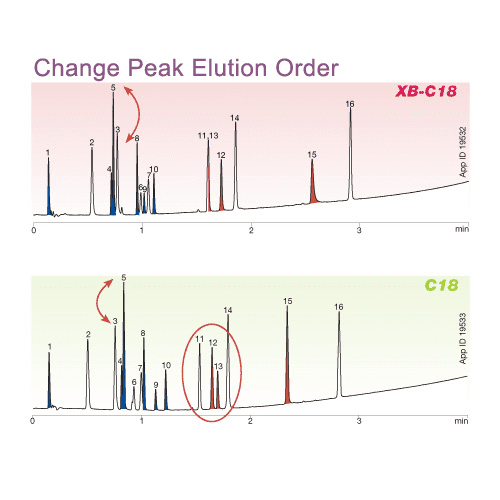 Get the most performance out of your HPLC system with some minor system adjustments. See how easy it is to get UHPLC performance on your HPLC system with Kinetex Core-Shell Technology. This kit comes complete with all the tubing and fittings that is needed to decrease the system dwell volume of your HPLC instrument, instantly improving the observed performance of your Kinetex core-shell column. Q1: How does the backpressure of Kinetex 2.6 µm core-shell compare to 3 and 5 µm fully porous columns? A1: Under the same running conditions and column dimension a 3.5x increase (vs. 5 µm fully porous particle) and a 1.3x increase (vs. 3 µm fully porous particle) in backpressure is typically observed. However, the increased performance provided by Kinetex 2.6 µm columns allows the use of shorter length columns to mitigate increases in backpressure. For an estimate of the backpressure you will experience when using a Kinetex 2.6 µm column on your current method visit The Kinetex Calculator. NOTE - Typically backpressures experienced when using Kinetex 2.6 µm columns are within the pressure limitations of conventional HPLC systems. Q2: How does the backpressure of Kinetex 2.6 µm core-shell compare to 1.7 µm fully porous columns? A2: Kinetex 1.7 µm core-shell columns result in backpressures that are comparable to other sub-2 µm columns in the market. Chromatographers can expect lower backpressure when using a Kinetex 2.6 µm vs. Kinetex 1.7 µm column. Q3: How does the backpressure of Kinetex 1.7 µm core-shell compare to 1.7 µm fully porous columns? A3: Kinetex 1.7 µm core-shell columns result in backpressures that are comparable to other sub-2 µm columns in the market. A UHPLC system is required when using a Kinetex 1.7 µm core-shell column. Q4: How do I select the appropriate Kinetex core-shell column length and internal diameter (ID) when converting from my current 3 µm and 5 µm fully porous column dimensions? A4: To choose the correct length column for increasing productivity you can use this simple ratio comparison. Or, we've created a convenient online tool, The Kinetex Calculator, to assist with column selection when transferring from a fully porous to core-shell column. By entering your current method conditions and column dimensions, The Kinetex Calculator instantly converts your existing method to the optimized core-shell column dimension and running conditions to achieve UHPLC results. Q5: How does the lifetime of Kinetex core-shell columns compare to fully porous columns? A5: The lifetime of any column varies depending on factors such as the sample, sample preparation/column protection effectiveness, the mobile phase quality, and how well the system is maintained. Chromatographers can expect Kinetex column lifetimes equal to or greater than those achieved on fully-porous UHPLC columns. For significantly increased column lifetimes, use SecurityGuard ULTRA to protect your Kinetex column. Q6: How does the loading capacity of Kinetex core-shell compare to fully porous columns? A6: The effective surface area and resulting loading capacity of Kinetex core-shell columns is comparable to many fully porous particle columns on the market. However, loading capacity of any column is dependent on multiple factors including surface area of particle, packing density of materials, and charged state of the compounds being separated. Q7: What are the primary benefits of Kinetex core-shell technology compared to fully porous particles? A7: Kinetex 2.6 µm core-shell particles allow chromatographers to achieve UHPLC performance at significantly lower backpressures compared to sub-2 µm fully porous materials. 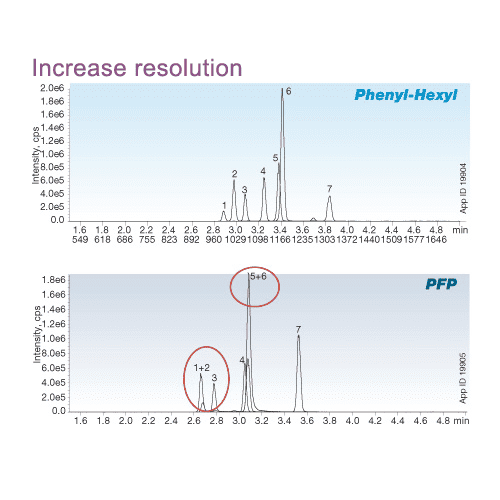 This translates to increased resolution, higher sensitivity, and faster analysis on conventional HPLC systems and UHPLC systems. Kinetex 1.7 µm core-shell particles have been shown to outperform sub-2 µm fully porous particles by 20% producing greater resolution and increased sensitivity. Q8: Are there any drawbacks of Kinetex core-shell technology? A8: Though Kinetex core-shell technology provides significant performance advantages in the analytical environment it is currently not available in preparative scale chromatography for purification purposes. Q9: Will my cost per sample decrease by converting my method from a 5 µm fully porous to a Kinetex 2.6 µm core-shell column? A9: By taking advantage of the up to 3x increase in performance 2.6 µm Kinetex columns offer over traditional 5 µm fully porous columns you can decrease your cost per sample. A 75 mm length, 2.6 µm Kinetex column has been shown to provide the same resolving power as a 250 mm length, 5 µm fully porous column. This reduction in column length results in cost savings by decreasing run time and solvent consumption. We've created a convenient online tool, The KinetexCalculator, that can assist you in calculating potential savings when transferring from a fully porous to core-shell column. Q10: How does the performance of Kinetex 2.6 µm core-shell columns compare to 3 µm and 5 µm fully porous columns? A10: Kinetex 2.6 µm particles provide roughly 3x the efficiency of 5 µm fully porous particles and 2x the efficiency of 3 µm fully porous particles without the need for specialized, high pressure instrumentation. Q11: By how much can I expect to reduce my analysis time by using a Kinetex core-shell column instead of a 3 µm or 5 µm fully porous column? A11: We've created a convenient online tool, The Kinetex Calculator, that can assist you in calculating reductions in analysis time when transferring from a fully porous to core-shell column. By entering your current fully porous method conditions and column dimensions, The Kinetex Calculator instantly optimizes your existing method with the correct core-shell column dimension and running conditions to achieve UHPLC results. Q12: Do I need to revalidate my method if I swap my current column to a Kinetex core-shell column? A12: You may not need to revalidate your method when switching to Kinetex. Governing bodies such as USP (United States Pharmacopeia), EP (European Pharmacopeia), & ICH (International Committee on Harmonization) state that certain changes in column dimension, particle size, and running conditions are allowable without the need for method revalidation. However, most companies have their own guidelines for what determines whether method revalidation is required and should be consulted first. Q13: I'm still unsure about whether or not Kinetex core-shell technology will realize its theoretical potential in practice. Do you have any third party references or case studies? A13: Yes. A number of peer reviewed journal articles have explored the theoretical and observed performance of Kinetex core-shell technology and compared it to other HPLC and UHPLC products on the market. Access several of these publications courtesy of Phenomenex. Q1: Are there any Kinetex dimensions that do not fit in HPLC and/or UHPLC system column heaters? A1: All available Kinetex lengths fit into commercially available HPLC and UHPLC system column heaters. Q2: Are there guard/ pre-columns columns available to extend the lifetime of my Kinetex core-shell columns? A2: Yes. SecurityGuard ULTRA, a guard cartridge system for UHPLC columns, is designed to protect and extend the lifetime of core-shell columns on both HPLC and UHPLC systems. Q3: What is the price of Kinetex core-shell columns? A3: The price of Kinetex columns vary based on particle size and dimension. Log into the Phenomenex website to view pricing or contact your local Phenomenex representative. Q4: What is the pH range of Kinetex core-shell columns? Q5: What Kinetex core-shell phases/selectivities are currently available? A5: There are currently six phases available, including C18, XB-C18, C8, PFP, Phenyl-Hexyl, & HILIC. Q6: What Kinetex column dimensions are available? A6: Lengths available range from 30 mm to 150 mm. Internal diameters range from 2.1 mm to 4.6 mm. Particle sizes available include 1.7 µm and 2.6 µm. Q7: What injection volume is possible on Kinetex core-shell columns? A7: Use injection volume ranges typically associated with the internal diameter of fully porous columns. Q8: Will the Kinetex C18 and XB-C18 chemistries give me similar selectivity to a standard fully porous C18 column? A8: Yes, you can expect similar hydrophobic selectivity to standard C18 phases. 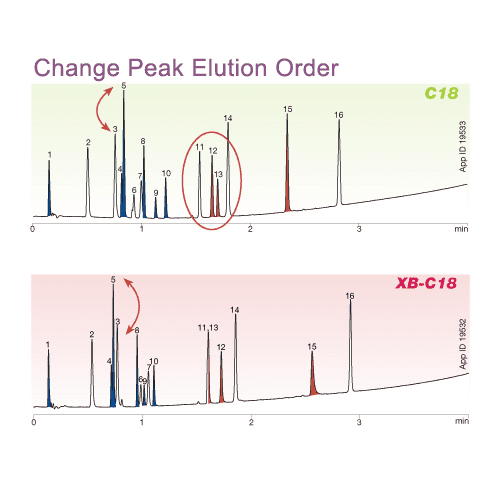 We recommend that chromatographers have both the C18 and the XB-C18 phases at their disposal since both chemistries have been shown to offer complementary selectivities to each other increasing the chances of successful compound separation. Q9: I need a Kinetex dimension that is currently not available. Is there a way to request a custom dimension? A9: For custom Kinetex column dimension requests, contact your local Phenomenex representative. Q10: Can I use Kinetex UHPLC columns even if I don't have a high pressure capable system? A10: Yes. Kinetex 2.6 µm columns were designed specifically for UHPLC performance without the drawbacks of ultra-high pressure. For an estimate of the backpressure and performance increases you will experience when using a Kinetex 2.6 µm column on your current method visit The Kinetex Calculator. Q11: Why is there not a 250 mm Kinetex core-shell column length available? A11: Currently, there has not been a need or demand for this dimension. Core-shell technology performance provided by 150 mm length (and shorter) columns have proven to meet and exceed the separation needs of HPLC and UHPLC users with the added benefits of solvent savings and reduced run times relative to 250 mm columns. Q12: Are Kinetex columns available in semi-preparative and/ or preparative dimensions? A12: Currently, Kinetex core-shell columns are only available in analytical dimensions. Q13: How do I connect my Kinetex column to my Waters ACQUITY® system? A13: It's easy. Follow the same steps you would for installing an Waters ACQUITY® column on your system. For additional help, we've created a short video which demonstrates the simple, 3-step process for connecting your Kinetex column to your system. Q1: Am I able to test a Kinetex core-shell technology column in my lab before I commit to purchasing one? A1: For inquiries about Kinetex column trials contact your local Phenomenex representative. Q2: Are there any tools available to assist me in selecting which Kinetex column would be most suitable for my method and the system I'm using? A2: We've created a convenient online tool, The Kinetex Calculator, to assist with column selection. By entering your current system type, method conditions and column dimensions, The Kinetex Calculator instantly optimizes your existing method with the correct core-shell column dimension and running conditions to achieve UHPLC results. Q3: How do I know which Kinetex core-shell particle size (2.6 µm or 1.7 µm) is most suitable for me? A3: Kinetex 1.7 µm particles result in pressures that are only compatible with UHPLC systems (pressure is equal to or greater than 400 bar). 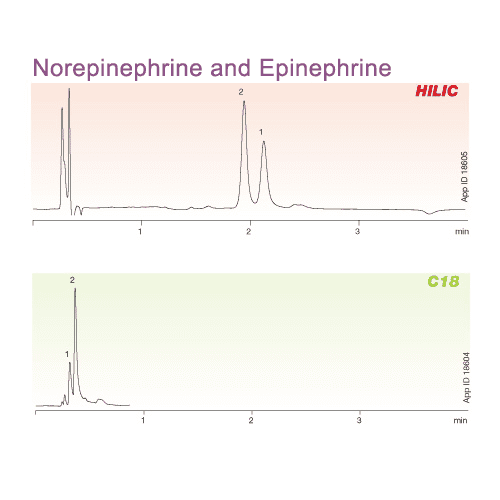 Kinetex 2.6 µm particles are compatible with HPLC and UHPLC systems pressure limits. Depending on the goal of your method, UHPLC system users may want to consider developing UHPLC methods on a Kinetex 2.6 µm core-shell column if they plan to transfer the method to labs using HPLC systems. We've created a convenient online tool, The Kinetex Calculator, that can assist you in choosing the most suitable particle size, column dimension, and running conditions for your separation goals. Q1: Is it possible to clean, backflush, and regenerate my Kinetex core-shell column? A1: Access the Kinetex column care and use guidelines to learn how to properly clean, backflush, and regenerate your column. To protect your Kinetex column from clogging, we recommend the SecurityGuard ULTRA column protection system. Q2: The lifetime of my Kinetex core-shell column is shorter than I expected, what might be the reasons for this? A2: The most common cause of decreased column lifetime is clogging of the inlet frit by particulates from systems seals, solvents, and samples. Prevent these particulates from reaching your Kinetex column by using the SecurityGuard ULTRA column protection system. Q3: I'm not achieving the efficiencies or performance promised by using core-shell technology on my HPLC system? Why is my column underperforming? A3: The most common cause of efficiency loss on core-shell columns is excess system dwell volume. Visit our system optimization section for tips on how to reduce the effects of excess system dwell volume. Q4: The backpressure generated by my Kinetex 2.6 µm column is higher than I am comfortable with, what can I do to reduce it? A4: There are number of things that can be done to decrease backpressure, including decreasing column length, increasing column internal diameter, adjusting mobile phase composition, and increasing temperature. The Kinetex Calculator allows you to virtually modify various method parameters and see the effect on the backpressure. Q5: Why is my column not generating reproducible results? A5: There are a number of reasons why you could be experiencing irreproducibility. Please contact your local Phenomenex representative to assist you in troubleshooting your reproducibility issue. Q6: Can I use the standard SecurityGuard guard cartridge system with my Kinetex column? A6: We don't recommend this. The standard SecurityGuard guard cartridge system was not designed for particles smaller than 3 µm and therefore introduces additional dead volume reducing column and system performance. In addition, it is it is not pressure rated for UHPLC applications (> 3500 psi). We do offer SecurityGuard ULTRA to meet the demanding performance needs of core-shell technology. 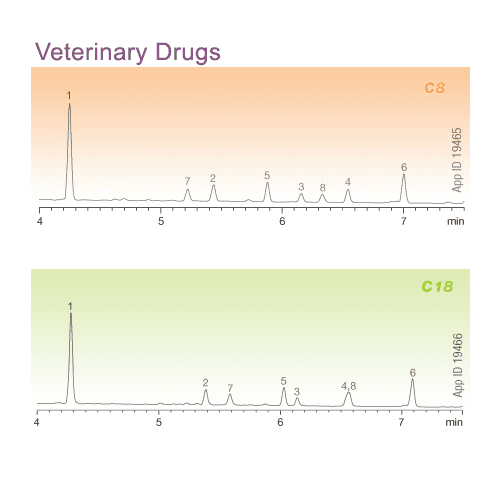 Q7: How come I am not seeing the same efficiency as that stated on my QC chromatogram shipped with the column? Q1: How do I adjust my gradient to get the full performance benefit of Kinetex core-shell technology? A1: We've created a convenient online tool, The Kinetex Calculator, that can assist you in calculating gradient and other method parameter adjustments to get the full performance benefit of Kinetex core-shell technology. For further assistance contact your local Phenomenex representative. Q2: I'm currently using a Kinetex core-shell C18 column, but it is not retaining my polar compounds. Are there any other Kinetex core-shell selectivities that would help with this? A2: If C18 and other Kinetex reversed phased selectivities are not retaining your polar compounds, we recommend trying the Kinetex HILIC phase. 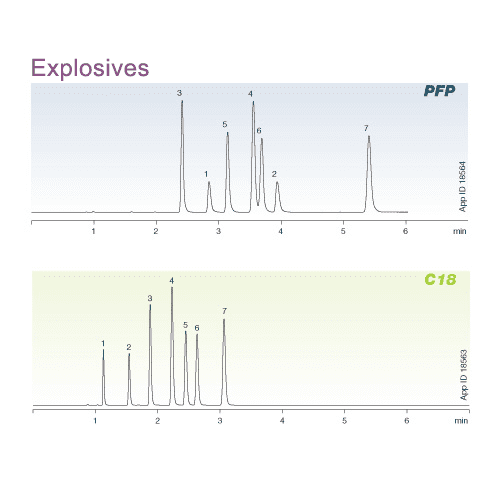 HILIC chromatography is well suited for the separation and retention of very polar compounds. Q3: How do I scale my method from a Kinetex 2.6 µm column to a Kinetex 1.7 µm column? A3: If the same column dimension is being used it may be possible to switch to Kinetex 1.7 µm column without any changes to your method parameters. However, if changing column dimensions be sure to adjust for the difference in column volume in order to maintain the same volumetric gradient profile. Q4: If I switch from using methanol to acetonitrile for my organic mobile phase component, how will my backpressure be impacted? A4: In general, you should experience a decrease in backpressure since acetonitrile is less viscous than methanol. Q5: What are the optimal flow rates for Kinetex core-shell columns to achieve maximum efficiency? Q6: What method and column parameters do I need to adjust when scale my fully porous 3 µm and 5 µm methods to Kinetex 2.6 µm? A6: We've created a convenient online tool, The Kinetex Calculator, to assist with column & method parameter adjustment when transferring from a fully porous to core-shell column. By entering your current method conditions and column dimensions, The Kinetex Calculator instantly optimizes your existing method with the correct core-shell column dimension and running conditions to achieve UHPLC results. Q7: What buffer systems can I use with my Kinetex HILIC phase? A7: The Kinetex HILIC phase can be operated in the pH range of 2.0-7.5. Though ammonium formate and ammonium acetate buffers have been shown to work well in HILIC chromatography there are no restrictions to the buffers you can use so long as you are operating within the suggested pH range. Q8: The recommended Kinetex flow rate for optimal separation is not compatible with my MS system. A8: If currently using a 3.0 mm or 4.6 mm diameter column, we recommend using a 2mm ID to work at flow rates compatible with your MS. If that is not an option, you will need to split the flow from the column to the MS so some will go to waste and only what MS can handle can be sent to MS.
With SecurityGuard ULTRA, contaminants and microparticulates are trapped in a guard cartridge, instead of your expensive column. the extremely low dead volumne (<0.3µL) of this unique guard design minimizes sample peak dispersion to maintain column performance without altering your chomratography results. When contaminants and particulates build up a t the head of your column, system pressure dramatically increases. By simply replacing the SecurityGuard ULTRA cartridge instead of your column you are able to regain normal operating conditions and reclaim original column performance.